Stories that explore personal experiences and the lessons learned throughout this thing we call life. Includes stories about transitioning in and out of school, finding a community or yourself, learning in and outside of the classroom, travelling, goal setting, and creativity. Includes student and alumni profiles, featuring specific students with a story to tell; project spotlights that focus on student work and why it matters; program spotlights that explore various aspects of what Ryerson has to offer. Stories related to and often written by the team that brings you Orientation each year, the week of programs and activities designed to welcome new students to Ryerson. Stories that share insider tips and tricks to navigating programs, resources, and places on campus, as well as the off-campus delights offered in the city of Toronto. Stories about the latest apps we’re into, gadgets we’re saving up for, and thoughts on how technology affects us every day; stories about research and innovation in various science fields. In the 250 Words series, the RU Student Life writers are posed a question, and in 250 words they each offer their insights. ThriveRU is a campus wide initiative created by Student Affairs whose purpose is to help students feel a sense of support on campus, to better appreciate the connections between academic success and other elements of a healthy lifestyle, and, primarily, to help students develop capacities for well-being that will serve them throughout their lives. Stories about ThriveRU explore the connections between academic success and resilience, well-being, and engaging with ThriveRU resources. Stories from international students about life in Canada, thoughts about home, and what it’s like studying in Canada. Includes new blogs and archived blogs from Ryerson International Student Support’s blog. The Makers Pod is a podcast by RU Student Life featuring conversations with creators, makers, and thinkers within the Ryerson University community in Toronto, Canada. Stories that contribute to or reflect on our understanding of the Ryerson and Toronto community, including discussions about diversity, politics, city life, activism, festivals, and holidays. Stories from students studying or travelling abroad, whether it’s a quick trip or a semester or two in a new place. Stories about upcoming Ryerson or Toronto events, and details about contests and giveaways brought to you by RU Student Life and others. Students documenting their transition to Ryerson. Stories related to graduation and all the feelings and events that come with it. If you ask any study abroad student in Europe what they’re most excited to do while on exchange, most people will say it’s travel. You can get pretty lucky and find a cheap bus, train, or plane ticket to some of the most popular cities in Europe. Taking your first trip during your exchange is almost a right of passage, and in mid-February I packed my bright purple Jansport and took off on my first out-of-England trip to Dublin, Ireland with my flat mate (and fellow Canadian) Karen. When planning for my exchange I had come up with a list of cities I wanted to visit, but Dublin had never crossed my mind until Karen showed me the $20 round trip airline tickets. Ryanair is truly a blessing. Our 3-day trip was a whirlwind but we were able to make the most of the time we had. So whether you’re getting ready for your own trip to Ireland or just curious about what it’s like, this post is for you! Technically, Day 1 started at around 9pm after we got in from our flight and checked into our hostel. Karen and I decided to use the few hours we had to explore the city’s famous nightlife. 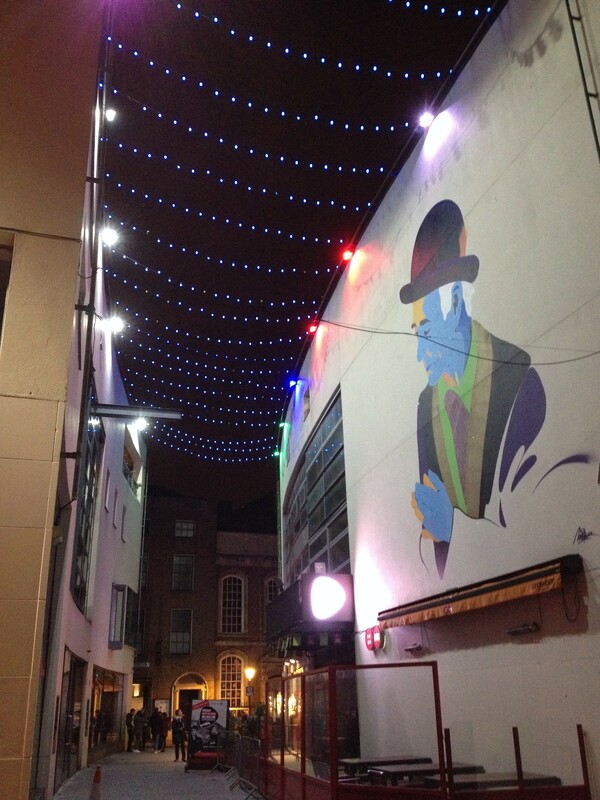 Our hostel was in the heart of Temple Bar, a busy area that is very popular with tourists. The atmosphere in Dublin is incredible: there are bright lights everywhere, live music on almost every street, and everyone we saw looked like they were having a great night. The only word I’ve been able to use so far to describe the atmosphere is happy. The vibe of the city is infectious, and it’s impossible not to be swept away by all the excitement. 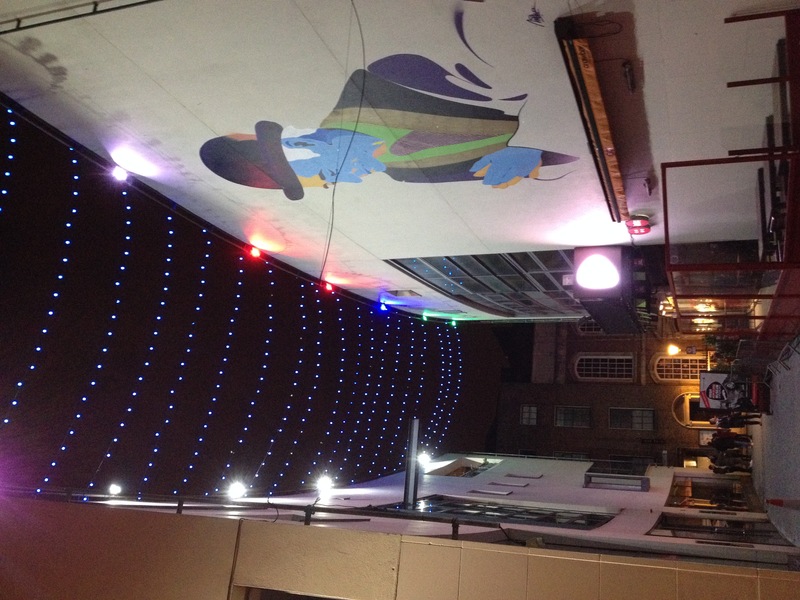 Murals and string lights, like the ones near my hostel (above), are common sights in Dublin. 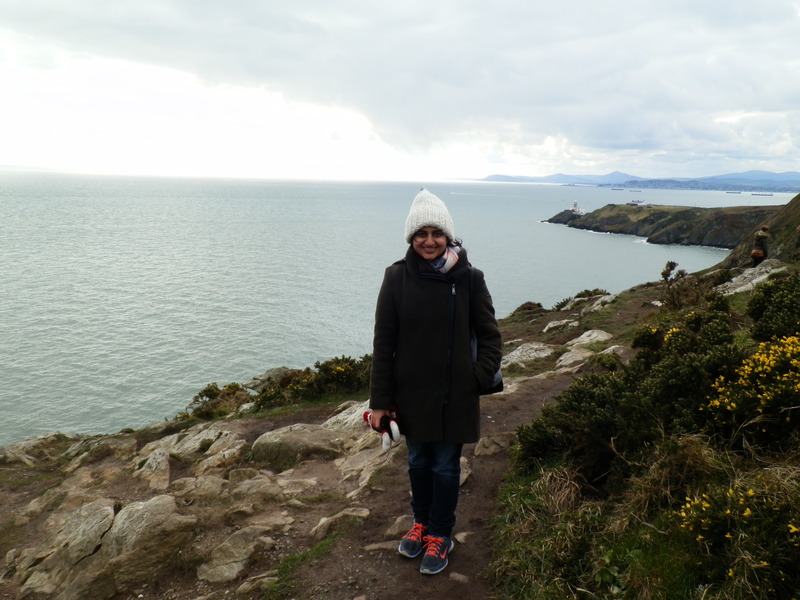 From the moment we booked our plane tickets, Karen had been excited to visit Howth, an old fishing village about 25 minutes away from Dublin by public transit. 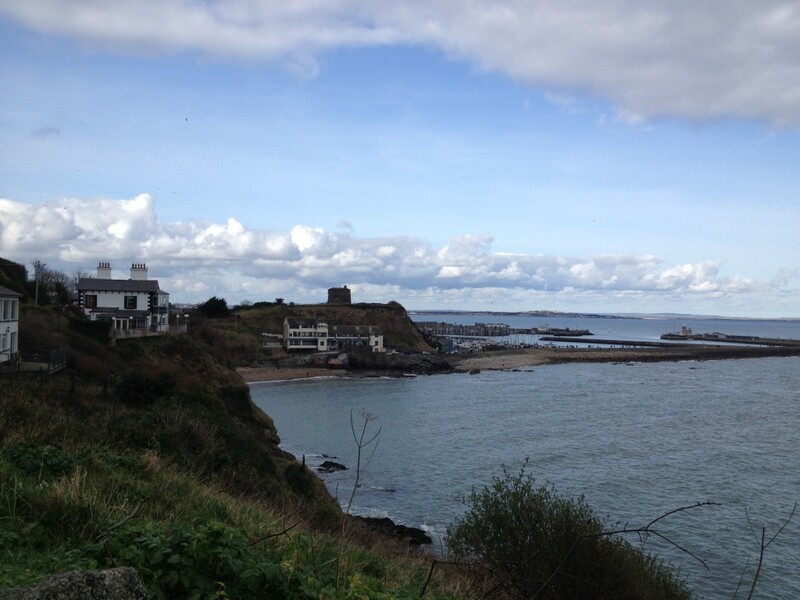 We were able to find a day tour that let us explore the Howth Cliffs. It was a nice, relaxing change compared to the hectic night we had just a few hours before. With our tour group we followed the walking path up to the top of the cliffs, and it was definitely a work out. At every turn you were surrounded by a breathtaking view of water and wildlife, which definitely made the hike worthwhile. After reaching the top of the cliffs and grabbing a bite to eat, Karen and I decided to stay back a little longer so we could explore the city. We were able to walk through the weekend market, grab a fresh juice, and walk along the docks. The weather was absolutely perfect, a stark contrast to the traditional gloomy Ireland weather. 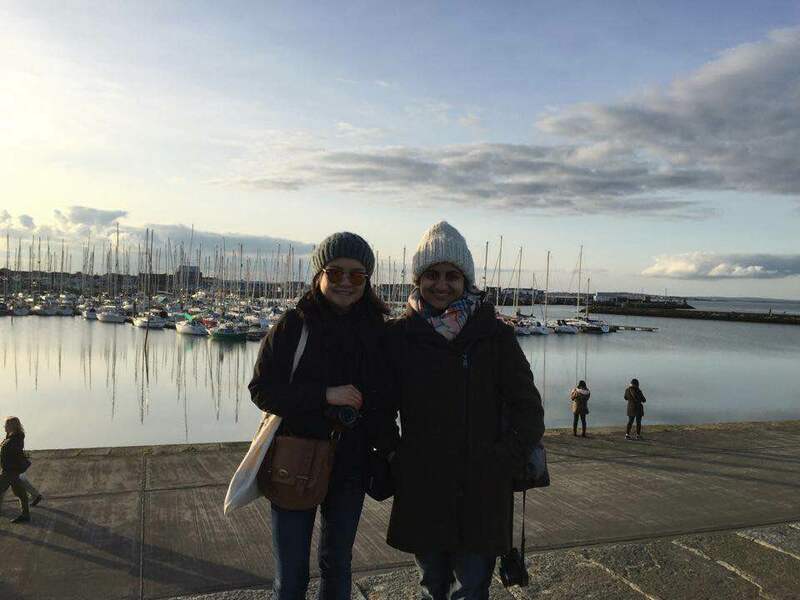 Karen and I by the docks in Howth. Karen and I woke up bright and early to make the most of our final day in Dublin. We spent the morning taking part in the free Sandeman‘s walking tour. I was pretty surprised when I learned that Dublin doesn’t have many tourist attractions. Despite this, our tour guide Conor was able to take us to some of the popular areas, like Dublin Castle, Trinity College, and the Spire of Dublin (aka the Monument of Light). But the best part of the tour has to have been when we learned that there is a Tim Horton’s located in Dublin. Our search for timbits did not end successfully, but at least we now know to look more carefully for the store next time! 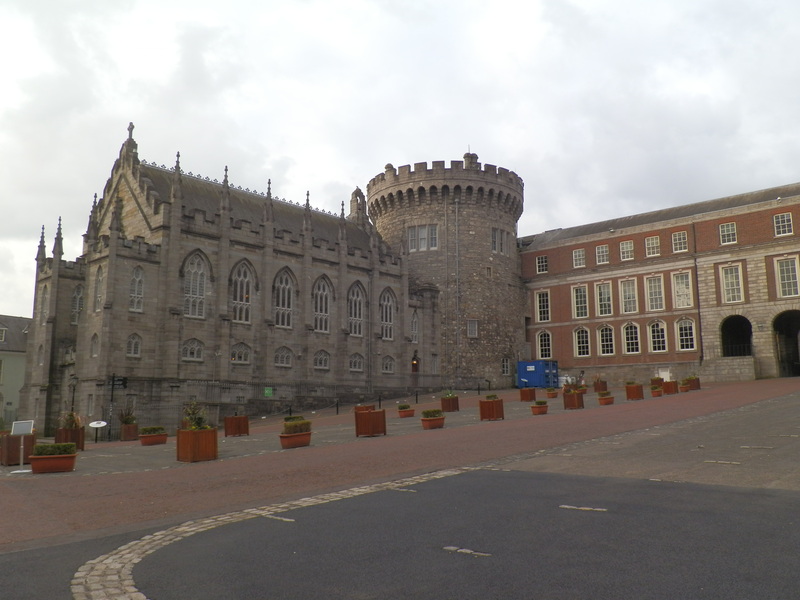 During the tour we were able to walk the grounds of Dublin Castle. 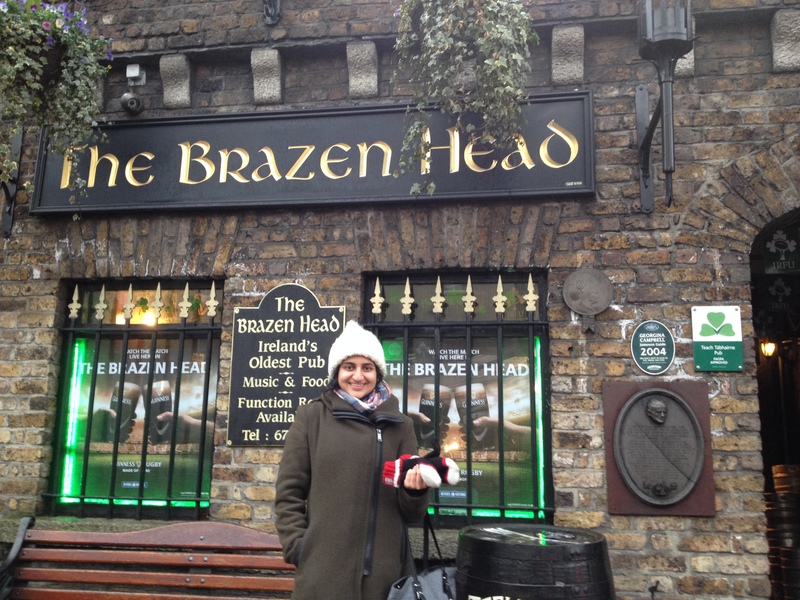 Checking out the famous Brazen Head, the world’s oldest Irish pub. After spending a few hours walking around, drinking Irish coffee, and writing post cards to family and friends, we headed to The Stags Head to check out a free comedy show. 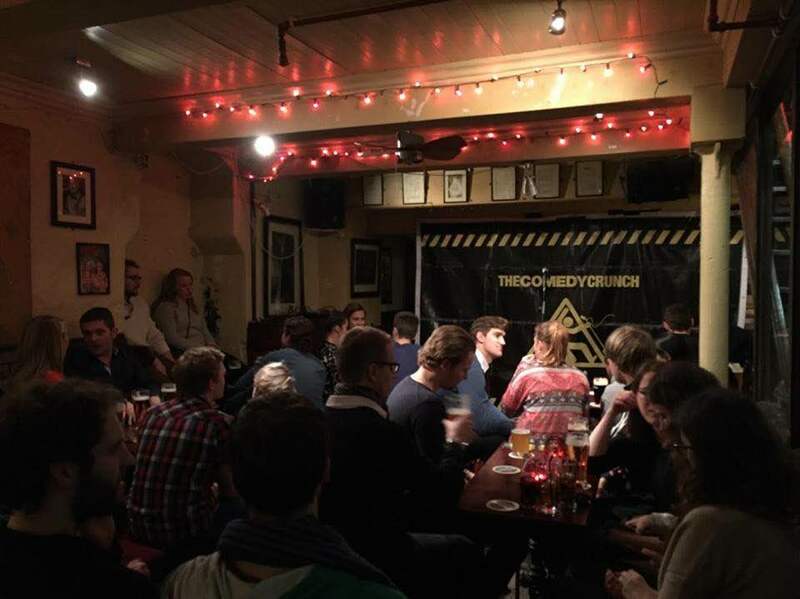 While we had to leave halfway through the show so we could catch our flight home, the comedians we were able to catch were hilarious, and we didn’t mind some of the jokes made about us studying in Leeds. All in all, our trip to Dublin was an incredible few days. Last minute adventures like this are a nice change from my usual strictly scheduled trips, and it really allowed me to enjoy the experience. Dublin has quickly become one of my favourite cities so far, and I’m already hoping for another visit! Hi! 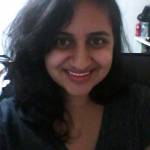 My name is Karishma and I am a third year Business Management student, currently on exchange at the University of Leeds in England. When I’m not watching one of my usual Netflix marathons, you can usually find me reading a book or obsessively listening to a new album I just heard. I’m excited to be sharing my study abroad experience as part of the RU Abroad blog for this semester! I’ll also be posting about my experiences on Twitter and Instagram, so be sure to follow along! By students, for students: RU Student Life is dedicated to sharing stories of what it's really like to be a Ryerson student. We strive to make everything inspiring, informational, amusing, useful, and critical, and we believe every one of us has a story worth sharing. Visit studentlife.ryerson.ca/about to find out more.